As a result of the mortgage crisis and the collapse of numerous banks, many homeowners were threatened with foreclosure. However, many of these homeowners were unaware of their rights and assumed a Notice of Default meant their home was lost to foreclosure. In reality, a Notice of Default is merely the first step to a foreclosure. Abandoning the property before the foreclosure is complete means that the homeowners remain on title to the property for years, even though nobody is living on the property. Many people abandoned their homes under the mistaken belief that their home had been foreclosed, but unbeknownst to them, they remained the record property owner. The scenario when a homeowner abandoned the home, but remains on title, is known as Zombie Foreclosure. Zombie foreclosures have plagued many communities, particularly in lower-income areas. Why don’t the banks complete the foreclosure? This is a question with no official answer. After the foreclosure crisis, banks were either bankrupt, seized by the government, or were handed $700 billion dollars for their incompetence. The dust has still not settled on many of these loans. There is no official answer to the zombie foreclosure epidemic, but below are three common theories. Banks are manipulating the housing market by not taken possession of the homes. The lack of oversight due to the creation of the private entity known as the Mortgage Electronic Registration System (MERS), which was created to circumvent County Recorder Requirements, allows banks to freely assign loans from one bank to another. This results in an entity like THE BANK OF NEW YORK MELLON FKA THE BANK OF NEW YORK AS TRUSTEE FOR THE CERTIFICATEHOLDERS OF THE CWABS, INC., ASSET-BACKED CERTIFICATES, SERIES 2005-IM3 owning the loan. Figuring out who even has the right to the loan in the above situation is difficult. Many owners also declared bankruptcy, which prevents banks from foreclosing on homeowners as a result of the automatic stay. These abandoned homes become drug dens, squatter residences, or become so dilapidated that they burn down. These dilapidated homes attract more serious criminal elements, thereby further harming the surrounding community. What is particularly frustrating in these scenarios is that nobody takes responsibility. The homeowner doesn’t think they own the home, the bank will say it is the homeowner’s responsibility or the bank will claim the loan was assigned to another bank. This leaves everyone pointing the finger at someone else and the community plagued by a dangerous home. 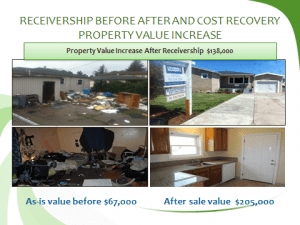 However, there is a remedy to zombie foreclosures in California known as Health & Safety Receivership. This allows an enforcement agency, tenant, or tenant’s association to request the court to take over a property that endangers the Health and Safety of the surrounding community. 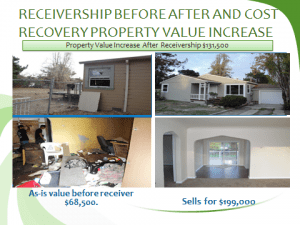 If the receivership request is successful, then the court takes the property over and will authorize a private receiver to take control of the property and rehab under court supervision. This remedy is not the same as eminent domain, because the private receiver takes the risk of managing the property, not the government. If the receiver successfully rehabs and sells the property, then they are paid a court-awarded fee and whatever is left from the sale is given to the bank and homeowner. This remedy is slowly gaining popularity in California and becoming a more common tool utilized by government agencies, tenants and tenant associations to combat zombie foreclosure.